Self-sufficient farming was hard work. The Leggroan family tried to make their land produce all they needed to survive. They made everything they could, from soap to syrup. They raised wheat that had to be ground at one of the grist mills situated on the creek that flowed from the canyon on the east. They fed the bran and the shorts to the animals and used the flour for baking. Jane saw to it that all the fruits and vegetables were stored for the winter. They made hominy out of corn, dried peaches and apples, and “pitted” vegetables. “They dug long trenches…they filled [them]…with straw and …put their cabbage with roots up [in the trenches].”  They covered the cabbage with dirt and repeated the process with potatoes and parsnips. The Leggroans hunted and fished and raised beef, pigs, and sheep. If Clayton’s remembrances are accurate, the African American members of the Wilford Ward were “accepted…as members,” but leaders and other members did not encourage them to fully participate in ward life. Bishops and some older ward members were kind to Jane and her family, but Jane watched Mormon neighbors get up and move a seat away from her when she sat down in Church meetings. Somehow Jane was able to put slights and hurt feelings aside to remain committed to the LDS faith throughout her life. Bankhead, Henrietta Leggroan. (Daughter of Henry and Esther James Leggroan and resident of Mill Creek, Utah). Oral interview by Florence [Leggroan] Lawrence. Salt Lake City, Utah, 1977. Transcript. Helen Zeese Papanikolas Papers, 1954-2001. Ms0471, box 2, folder 3. Special Collections, J. Willard Marriott Library, University of Utah, Salt Lake City. Church of Jesus Christ of Latter-day Saints, Record of Members Collection. Wilford Ward, Part 1. CR 375 8, box 7640, folder 1, image 31. Church History Library, Salt Lake City, Utah. Church of Jesus Christ of Latter-day Saints, First Ward Minutes and Record of Members. LR 2871 26. Church History Library, Salt Lake City, Utah. Clayton, Annie [Eliza Dexter]. (Longtime resident of Mill Creek, Utah). Oral interview by William G. Hartley. Salt Lake City, Utah, 1972. Transcript. OH 1. Church History Library, Church of Jesus Christ of Latter-day Saints, Salt Lake City, Utah. “Leggroan.” Presiding Bishopric stake and mission census, 1914-1935. Granite Stake. Wilford Ward. 11 Dec 1914, 16 Dec 1920, 31 Dec 1925, Aug 1930, 6 May 1935. CR 4 311. Church History Library, Church of Latter-day Saints, Salt Lake City, Utah. United States. 1870 Census. Utah Territory, Salt Lake County, Salt Lake City 1st Ward. United States. 1880 Census. Utah Territory, Salt Lake County, Salt Lake City 1st Ward. United States. 1900 Census. Utah, Salt Lake County, Mill Creek. United States. 1910 Census. Utah, Salt Lake County, Wilford. Utah. County Marriages, 1887-1940. Henry Leggroan and Esther Jane James, 20 May1889. Microfilm 429,054. Family History Library, Church of Jesus Christ of Latter-day Saints, Salt Lake City, Utah. Utah State Board of Health. Leggroan, Esther Jane. Certificate of Death. Bureau of Vital Statistics. File No. 20. Utah State Archives, Salt Lake City, Utah. Black, Susan Easton. Compiler. Membership of The Church of Jesus Christ of Latter-day Saints, 1830–1848 . 50 vols. Provo, Utah: Brigham Young University Religious Studies Center, 1989. Leggroan, Esther Jane James. Findagrave.com. Mormon Pioneer Overland Travel Database, 1947-1868. The Church of Jesus Christ of Latter-day Saints. 44, no. 4 (October 2018): forthcoming. United States, 1870 Census, Utah Territory, Salt Lake County, Salt Lake City 1st Ward. Mormon Pioneer Overland Travel Database, 1847-1868. Church of Jesus Christ of Latter-day Saints, Salt Lake City, Utah. Church of Jesus Christ of Latter-day Saints, First Ward Minutes and Record of Members, LR 2871 26, Church History Library, Salt Lake City, Utah; Church of Jesus Christ of Latter-day Saints. Record of Members Collection. Salt Lake 1st Ward. CR 375 8, box 2168, folder 1, image 59. Church History Library, Salt Lake City, Utah. Tonya S. Reiter, “Life on the Hill, Black Farmers and Their Families in Mill Creek, Utah,” Journal of Mormon History, 44, no. 4 (October 2018): forthcoming. Henrietta Leggroan Bankhead, oral interview by Florence Lawrence, Salt Lake City, Utah, 1977, transcript, Helen Zeese Papanikolas Papers, 1954-2001, Ms0471, box 2, folder 3, 15, Special Collections, J. Willard Marriott Library, University of Utah, Salt Lake City, Utah. Henrietta Bankhead, oral interview, 19. Henrietta Bankhead, oral interview, 15. 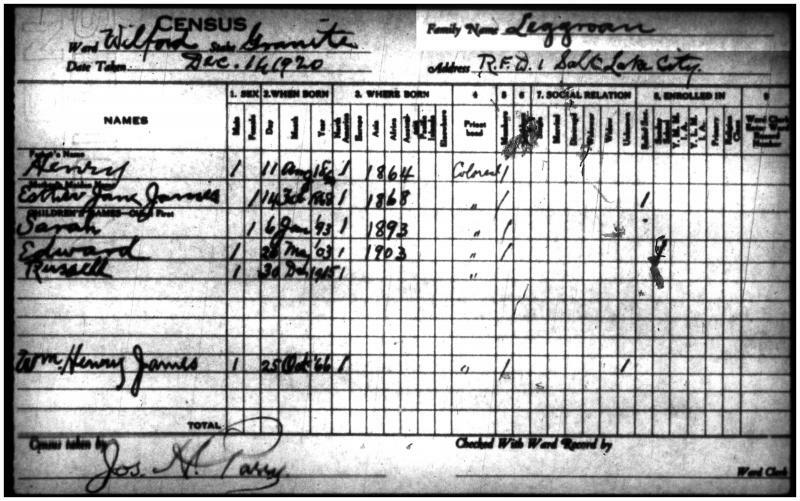 “Leggroan,” Presiding Bishopric stake and mission census, 1914-1935,CR 4 311, Church History Library, Church of Jesus Christ of Latter-day Saints, Salt Lake City, Utah. Annie D. Clayton, oral interview, William G. Hartley, Salt Lake City, Utah, 1972, 9, transcript, OH 1, Church History Library, The Church of Jesus Christ of Latter-day Saints, Salt Lake City, Utah. Annie Clayton, oral interview, 23. Annie Clayton, oral interview, 3. Annie Clayton, oral interview, 24.